Fundraising for downed riders is nothing new. I remember growing up seeing flyers everywhere from diners to car shows to local swap meets advertising BBQ’s or poker runs benefiting an injured rider or their family. The basis being: a community coming together to help lift someone up in their time of need. That still happens today, but the means in which the community interacts has changed dramatically. The network we build as individuals is constantly with us, at least they are after a couple of buttons get pushed on your computer or smartphone. The ability to instantly reach an audience or (in the fundraising world) potential contributors has grown exponentially from the days of taping flyers up around your locale. Today, events, fundraisers, and incidents are broadcast to an increasingly wider audience via social media and the internet. One of the organizations at the forefront of this new landscape is Moto F.A.M. who recently celebrated their third anniversary at Cook’s Corner in Southern California. The event is an annual benefit to raise funds that Moto F.A.M. donates directly to injured riders. A long list of industry sponsors donated to the event’s raffle. 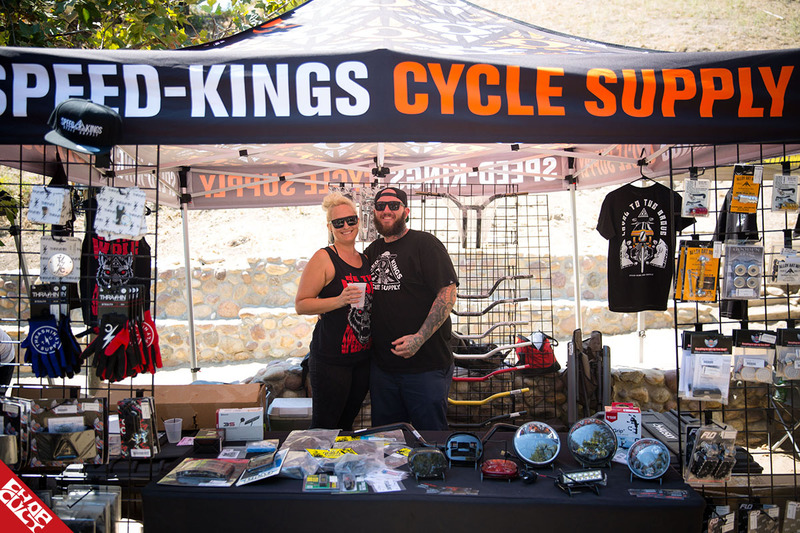 A handful of attendees were lucky enough to take home some killer prizes from the likes of Bassani, Bell, Biltwell, Dixxon Flannel, Speed-Kings Cycles, Cycle Zombies, and Oakley to name a few. The party is full of the warm fuzzy feelings of a community coming together for a great cause, but there is a deeper meaning behind Moto F.A.M. as an organization. 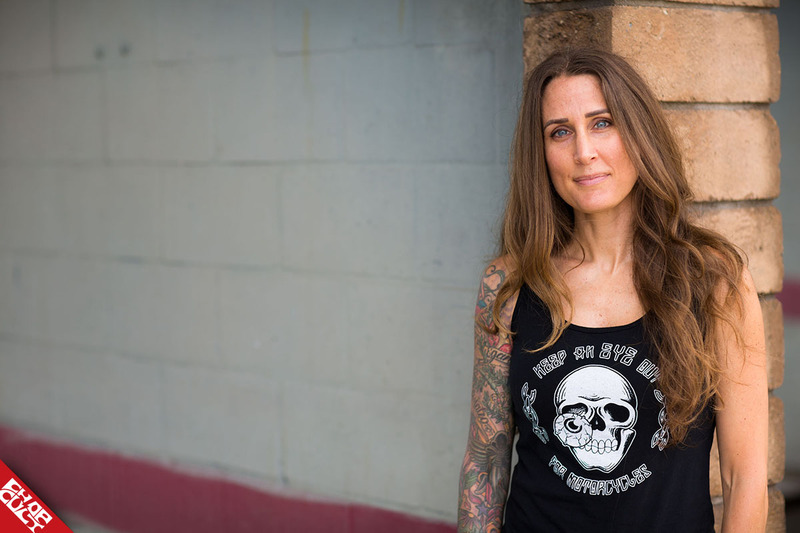 For more background I reached out the Michaela George, the founder of Moto F.A.M. Mich, what led to the creation of Moto F.A.M.? Being a rider yourself, how much of that had an impact on you starting such an organization. It impacted it heavily. This could be any of us at any time.Each time I saw a post about an accident it would sit with me emotionally for a while. Eventually I started brainstorming on ways I could help. No matter how small of a contribution, I just felt like I needed to do something. What are the various types of incidents Moto F.A.M. lends a helping hand to? We emphasize "life changing" accidents. So far, we have lent a hand to riders that now suffer paralysis, or amputation of a limb. 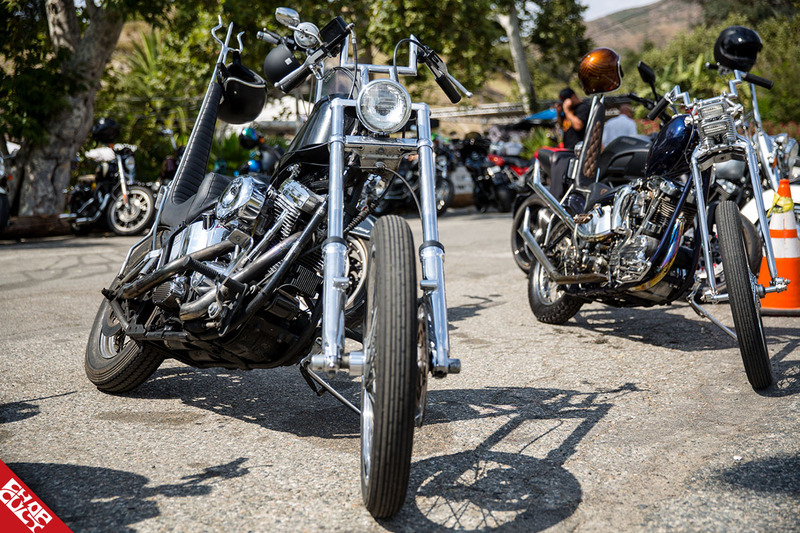 We have helped riders with traumatic brain injuries as well as families that have lost a loved one. Our goal is to help people whose lives will forever be changed because of their accident. Can you explain the process, in which Moto F.A.M. learns of an accident, decides to help, and then delivers help to the victim/victims? 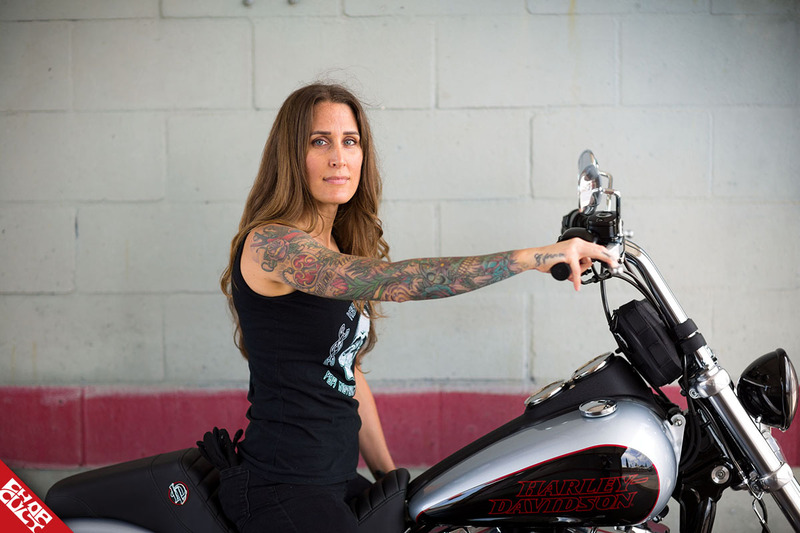 We learn about rider’s accidents a couple different ways but primarily through social media. We try to direct people to request help through our website. We do this because there are three strict requirements a rider must meet in order to qualify for help. 3.) 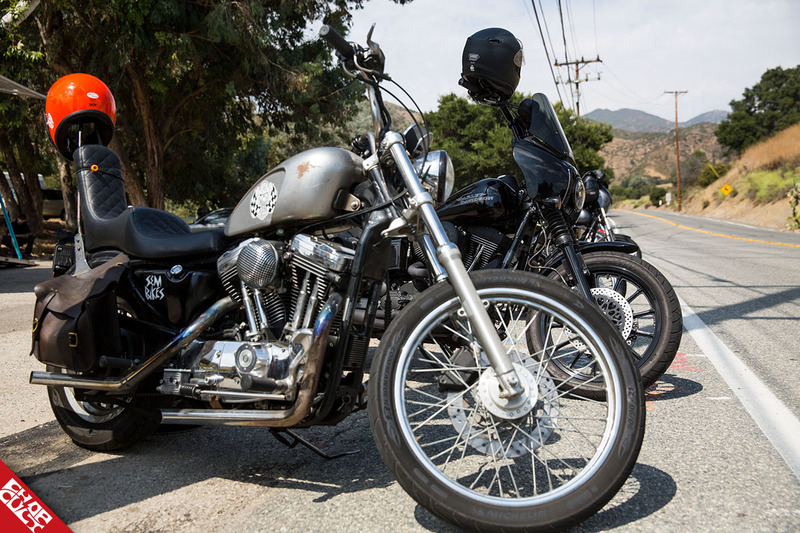 A rider must have a license or permit to operate a motorcycle. Once the rider (or person on behalf of the rider) confirms these three things, and completes the application process, we donate $500 to the riders fundraising campaign. GoFundMe seems to be the most popular type of campaign. Once we make our donation, we post the information to our social media. We do this to continue to promote and raise money for these riders. Moto F.A.M. clearly utilizes a multitude of social media platforms in order to operate, how integral is this to the everyday operations of the organization? Social media is very crucial. Our organization relies on the power of networks like Instagram, Facebook, and GoFundMe. There is nothing like it in the sense that one image can be seen by literally THOUSANDS of people. That means there is a possibility for thousands of potential supporters/donators. All of these incidents have varying degrees of severity but all have life changing implications. What are some of the most memorable moments of how Moto F.A.M. has helped people? Every situation is memorable to me personally because I see such a vulnerable time in these peoples’ lives. I get to watch them go through their recovery and overcome such horrific circumstances. It's a crazy thing to witness. I think one of the more memorable situations we have helped with was Cody Smith, a rider from Orange County. When we were contacted about his accident he was in critical condition, with a list of injuries unlike any I had seen so far. Since first hearing about him in November 2015 he has done so much! He moved his family to Colorado to work with the best spinal cord injury hospitals in the United States. He is paralyzed from the waste down but in no way does he let his situation confine him. He's extremely active. He's a proud father and family man. He has crushed so many milestones throughout his recovery. I have literally yelled out loud in my living room as I have seen videos of him driving a car again, or walk using an exoskeleton. He claims he can do more pull ups than me now, so I feel like there may be a one-on-one competition happening sometime soon. But all kidding aside, I learn a little bit from each person we help. Their strength, determination, and ability to adapt is incredibly inspiring. It reminds me there's more to life than the everyday routine we're blinded by. It's kind of hard and probably a little too heavy to explain but I do hold a special place in my heart for everyone we help. I think it's also important to say, as much as the financial help is needed, it's the emotional support that rings loudest to all these riders. It's something I hear over and over with each of them. There is genuine gratitude these riders feel when they realize there are people out there that don't know them personally yet offer their help and kind words. It's a powerful thing. It's the definition of community. It’s not just you doing all of the legwork at the organization, who else helps you out? Moto F.A.M. has three board members. Damon George, Chelsea Holmes, and Sanna Coates. We also rely heavily on all of our regular volunteers too. People like Jesse Falvy, Mallorie George, Lisa Troop, Edith Levin, Robyn Ford, Jeff Holmes, Chris Huber, Danny Gorman and JaNea Drown, just to name a few. You just celebrated your 3rd annual fundraiser, congrats! What other events does Moto F.A.M. attend and take part in? We are very fortunate to take part in several events throughout the year. There are people/companies that create events and make Moto F. A. M. the beneficiary. Some of the companies such as Spoke & Dagger Co., Belles on Bikes, LandSpeed Motorcycle Shop and Lost Highway Show have done this for us. Our biggest partnership each year comes from Babes Ride Out. Twice a year they throw an event (on the west & east coasts) and raffle off items. The proceeds from these events help to raise thousands for these riders. How do others help Moto F.A.M.? Moto F.A.M. truly is a community effort. Everyone that knows about our cause and helps at any level is making a difference. Whether it's donating directly to us, or to a rider we post about. You are helping when you attend an event. Buy raffle tickets. Post about our events or tag someone that needs our help. You are helping when you tell a friend about us. It's a HUGE help to us when companies send product to our events. 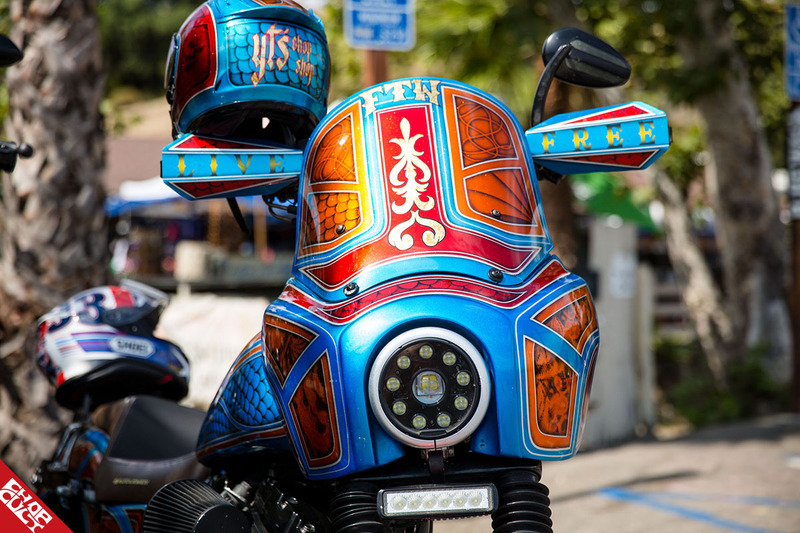 Companies like Biltwell, Bell PowerSports, Lucky Dave’s, Bassani Xhaust, Speed-Kings Cycle, Dixxon Flannel Co. and Oakley are all some of the big contributors to our events. The vendors that come and set up are helping too. Last year we received a $10,000 donation from Dixxon Flannel Co.!! This was a big deal to us for a couple of reasons. One, it was our largest single donation, ever. Two, it was from a company that was still fairly new and upcoming so for them to believe in and commit to our cause that way meant a lot to me. It meant we could help a lot of people. Even interviews like this help get the word out. ChopCult has been a huge supporter since day one. It all ties together, all of it. It's the sole reason Moto F.A.M. is able to help the people we do. What’s next for the organization? On top of that, if you had a wish list of what Moto F.A.M. could accomplish, what would that entail? We are currently working with an advanced rider clinic to customize and offer defensive rider training nationwide. We are working on offering these classes in four different locations, at no cost to the rider. 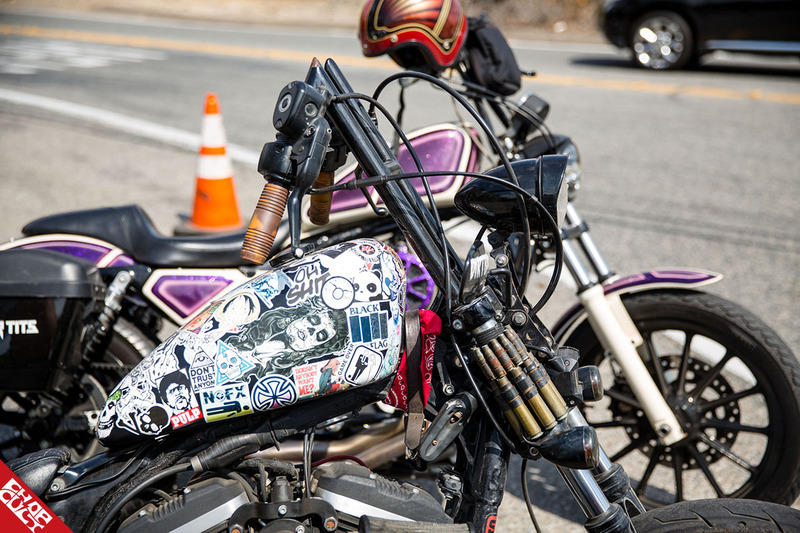 As far as our wish list, I'm brainstorming on ways to create a support group for not only the riders we have helped but anyone ever involved in a motorcycle accident, essentially a way for these people to talk with each other. There's a ton of questions people have as soon as they are involved in an accident. Questions about recovery, or legal implications. I feel it's important to be able to speak directly with other people that have been through this experience and can offer some guidance. Thanks for everything you do Mich. It’s great to see someone who takes pride in their community and looks for opportunities to give back. Is there anyone you would like to thank or give a shout out to? Go to MOTOFAM.ORG to get involved and be sure to give them a follow on Instagram and Facebook.